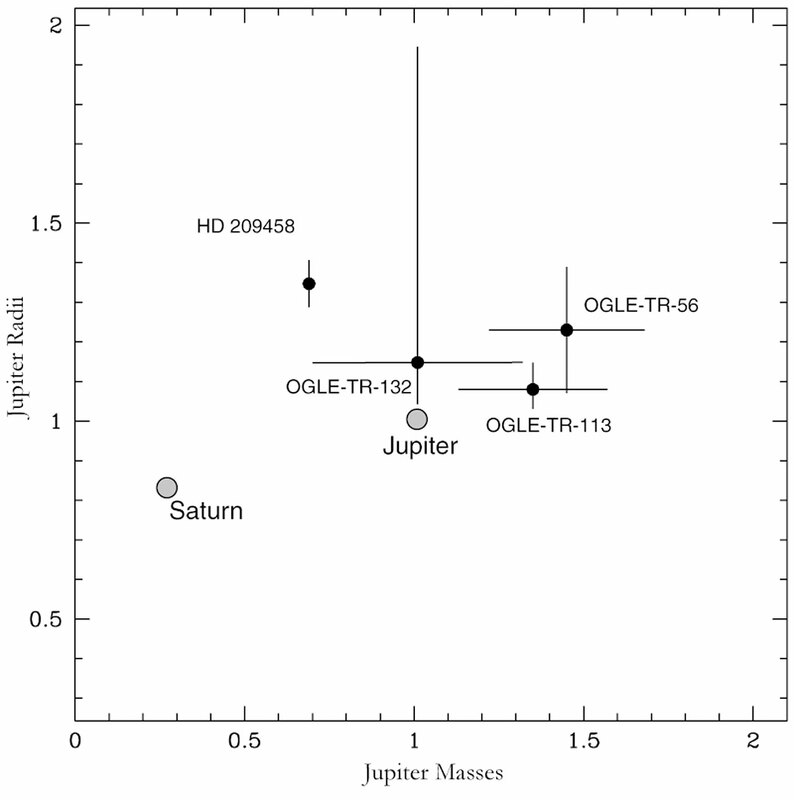 VLT Measures Properties of New Jupiter-Size Objects in Very Close Orbits. A European team of astronomers  are announcing the discovery and study of two new extra-solar planets (exoplanets). They belong to the OGLE transit candidate objects and could be characterized in detail. This trebles the number of exoplanets discovered by the transit method; three such objects are now known. The observations were performed in March 2004 with the FLAMES multi-fiber spectrograph on the 8.2-m VLT Kueyen telescope at the ESO Paranal Observatory (Chile). They enabled the astronomers to measure accurate radial velocities for forty-one stars for which a temporary brightness "dip" had been detected by the OGLE survey. This effect might be the signature of the transit in front of the star of an orbiting planet, but may also be caused by a small stellar companion. 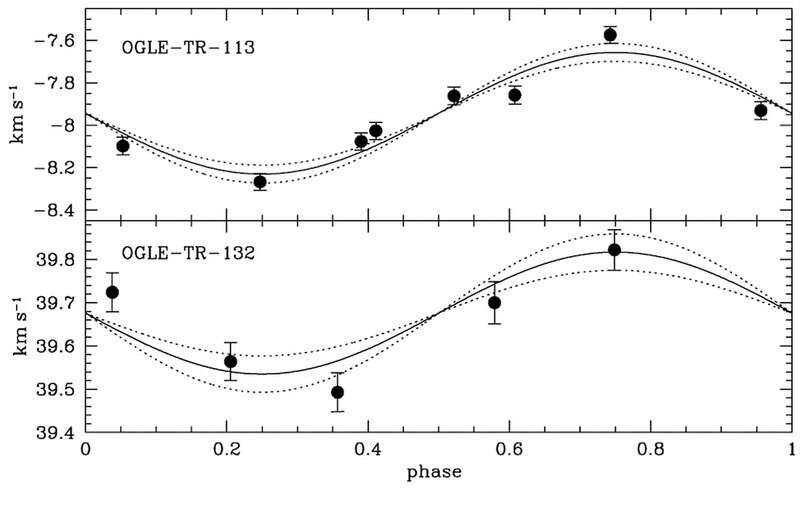 For two of the stars (OGLE-TR-113 and OGLE-TR-132), the measured velocity changes revealed the presence of planetary-mass companions in extremely short-period orbits. This result confirms the existence of a new class of giant planets, designated "very hot Jupiters" because of their size and very high surface temperature. They are extremely close to their host stars, orbiting them in less than 2 (Earth) days. The transit method for detecting exoplanets will be "demonstrated" for a wide public on June 8, 2004, when planet Venus passes in front of the solar disc, cf. the VT-2004 programme. During the past decade, astronomers have learned that our Solar System is not unique, as more than 120 giant planets orbiting other stars were discovered by radial-velocity surveys. However, the radial-velocity technique is not the only tool for the detection of exoplanets. When a planet happens to pass in front of its parent star (as seen from the Earth), it blocks a small fraction of the star's light from our view. The larger the planet is, relative to the star, the larger is the fraction of the light that is blocked. It is exactly the same effect when Venus transits the Solar disc on June 8, 2004, cf. the VT-2004 programme website. In the past centuries such events were used to estimate the Sun-Earth distance, with extremely useful implications for astrophysics and celestial mechanics. Nowadays, planetary transits are gaining renewed importance. Several surveys are attempting to find the faint signatures of other worlds, by means of stellar photometric measurements, searching for the periodic dimming of a star as a planet passes in front of its disc. 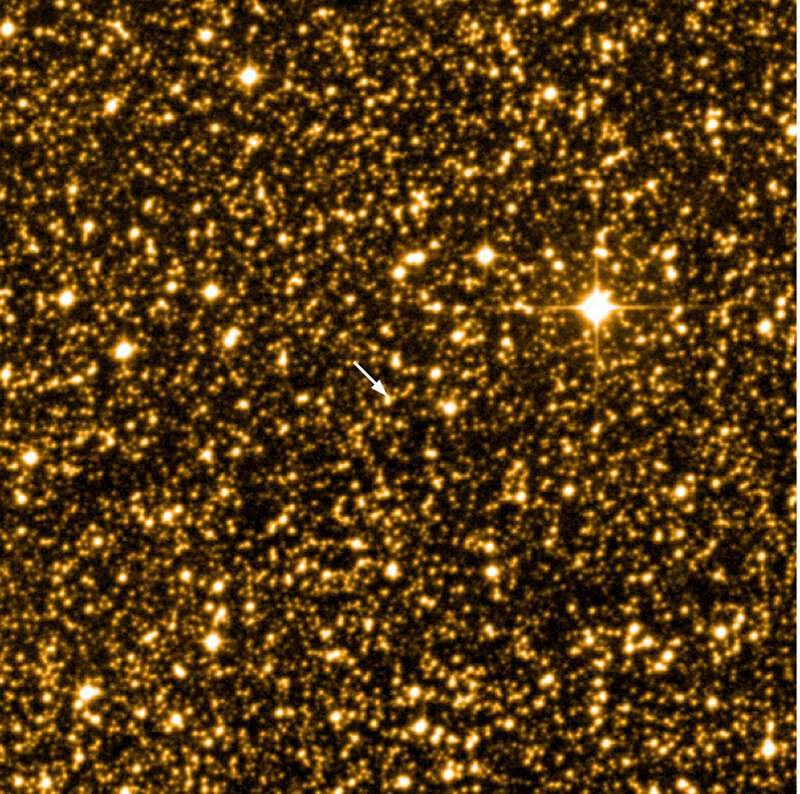 One of these, the OGLE survey, was originally devised to detect microlensing events by monitoring the brightness of a very large number of stars at regular intervals. 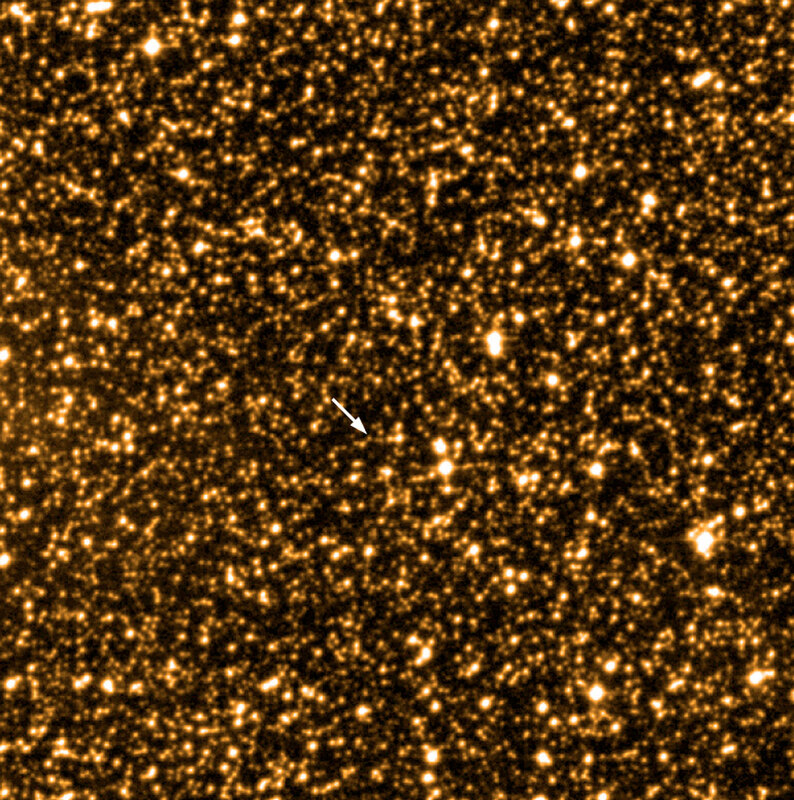 For the past four years, it has also included a search for periodical shallow "dips" of the brightness of stars, caused by the regular transit of small orbiting objects (small stars, brown dwarfs or Jupiter-size planets). The OGLE team has since announced 137 "planetary transit candidates" from their survey of about 155,000 stars in two southern sky fields, one in the direction of the Galactic Centre, the other within the Carina constellation. 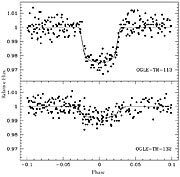 The OGLE transit candidates were detected by the presence of a periodic decrease of a few percent in brightness of the observed stars. The radius of a Jupiter-size planet is about 10 times smaller than that of a solar-type star , i.e. it covers about 1/100 of the surface of that star and hence it blocks about 1 % of the stellar light during the transit. The presence of a transit event alone, however, does not reveal the nature of the transiting body. This is because a low-mass star or a brown dwarf, as well as the variable brightness of a background eclipsing binary system seen in the same direction, may result in brightness variations that simulate the ones produced by an orbiting giant planet. However, the nature of the transiting object may be established by radial-velocity observations of the parent star. The size of the velocity variations (the amplitude) are directly related to the mass of the companion object and therefore allow to discriminate between stars and planets as the cause of the observed brightness "dip". In this way, photometric transit searches and radial-velocity measurements combine to become a very powerful technique to detect new exoplanets. Moreover, it is particularly useful for elucidating their characteristics. While the detection of a planet by the radial velocity method only yields a lower estimate of its mass, the measurement of the transit makes it possible to determine the exact mass, radius, and density of the planet. The follow-up radial-velocity observations of the 137 OGLE transit candidates is not an easy task as the stars are comparatively faint (visual magnitudes around 16). This can only be done by using a telescope in the 8-10m class with a high-resolution spectrograph. A European team of astronomers  therefore made use of the 8.2-m VLT Kueyen telescope. In March 2004, they followed 41 OGLE "top transit candidate stars" during 8 half-nights. They profited from the multiplex capacity of the FLAMES/UVES fiber link facility that permits to obtain high-resolution spectra of 8 objects simultaneously and measures stellar velocities with an accuracy of about 50 m/s. 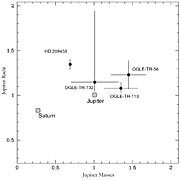 While the vast majority of OGLE transit candidates turned out to be binary stars (mostly small, cool stars transiting in front of solar-type stars), two of the objects, known as OGLE-TR-113 and OGLE-TR-132, were found to exhibit small velocity variations. When all available observations - light variations, the stellar spectrum and radial-velocity changes - were combined, the astronomers were able to determine that for these two stars, the transiting objects have masses compatible with those of a giant planet like Jupiter. Interestingly, both new planets were detected around rather remote stars in the Milky Way galaxy, in the direction of the southern constellation Carina. For OGLE-TR-113, the parent star is of F-type (slightly hotter and more massive than the Sun) and is located at a distance of about 6000 light-years. The orbiting planet is about 35% heavier and its diameter is 10% larger than that of Jupiter, the largest planet in the solar system. It orbits the star once every 1.43 days at a distance of only 3.4 million km (0.0228 AU). In the solar system, Mercury is 17 times farther away from the Sun. The surface temperature of that planet, which like Jupiter is a gaseous giant, is correspondingly higher, probably above 1800 °C. The distance to the OGLE-TR-132 system is about 1200 light-years. This planet is about as heavy as Jupiter and about 15% larger (its size is still somewhat uncertain). It orbits a K-dwarf star (cooler and less massive than the Sun) once every 1.69 days at a distance of 4.6 million km (0.0306 AU). Also this planet must be very hot. With the previously found planetary transit object OGLE-TR-56 , the two new OGLE objects define a new class of exoplanets, still not detected by current radial velocity surveys: planets with extremely short periods and correspondingly small orbits. The distribution of orbital periods for "hot Jupiters" detected from radial velocity surveys seems to drop off below 3 days, and no planet had previously been found with an orbital period shorter than about 2.5 days. The existence of the three OGLE planets now shows that "very hot Jupiters" do exist, even though they may be quite rare; probably about one such object for every 2500 to 7000 stars. 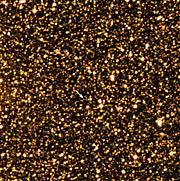 Astronomers are truly puzzled how planetary objects manage to end up in such small orbits, so near their central stars. Contrary to the radial velocity method which is responsible for the large majority of planet detections around normal stars, the combination of transit and radial-velocity observations makes it possible to determine the true mass, radius and thus the mean density of these planets. The two new objects double the number of exoplanets with known mass and radius (the three OGLE objects plus HD209458b, which was detected by the radial velocity surveys but for which a photometric transit was later observed). The new information about the exact masses and radii is essential for understanding the internal physics of these planets. The complementarity of the transit and radial velocity techniques now opens the door towards a detailed study of the true characteristics of exoplanets. Space-based searches for planetary transits - like the COROT and KEPLER missions - together with ground-based radial velocity follow-up observations will in the future lead to the characterization of other worlds as small as our Earth. The team consists of François Bouchy and Frédéric Pont at Laboratoire d'Astrophysique de Marseille (LAM) in France, Nuno Santos of the Lisbon Astronomical Observatory, Portugal, Claudio Melo of ESO-Chile, Michel Mayor, Didier Queloz and Stéphane Udry of the Geneva Observatory in Switzerland. Frédéric Pont is now associated with the Geneva Observatory. The diameter of Jupiter is about 11 times larger than that of the Earth. See CFA Press Release 03-01. 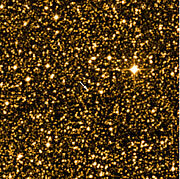 The Digitized Sky Survey was produced at the Space Telescope Science Institute under U.S. Government grant NAG W-2166. The images of these surveys are based on photographic data obtained using the Oschin Schmidt Telescope on Palomar Mountain and the UK Schmidt Telescope. The plates were processed into the present compressed digital form with the permission of these institutions. The information contained in this press release is based on a research article which is being published by the European research journal "Astronomy & Astrophysics" ("Two new 'very hot Jupiters' among OGLE transiting candidates", by François Bouchy and collaborators, astro-ph/0404264). 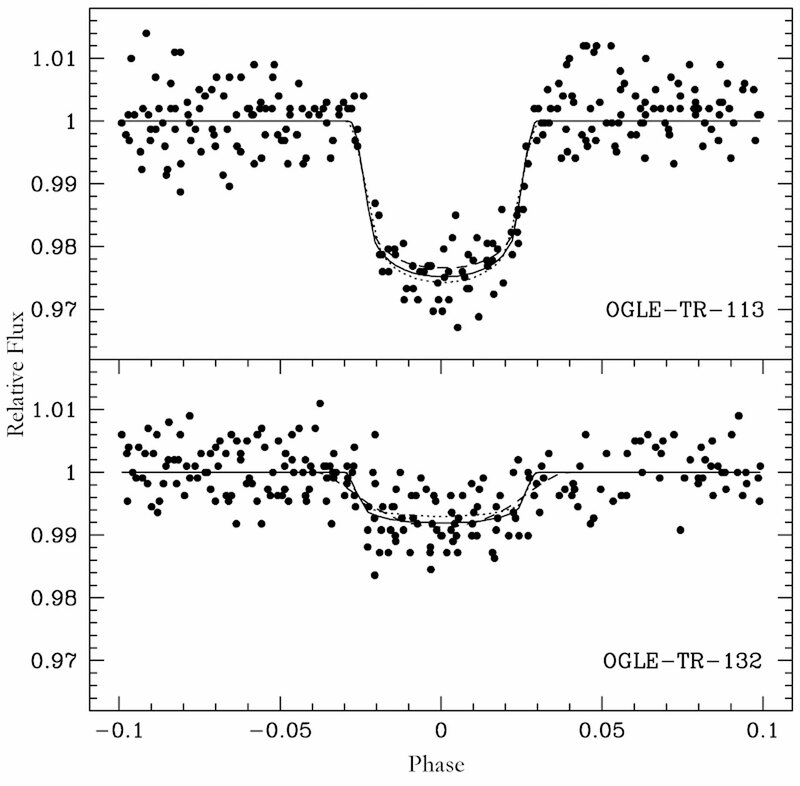 OGLE-TR-113b has recently been confirmed by another team of astronomers (astro-ph/0404541). Note also that the discovery last year of the ostensibly shortest-known-period planet orbiting OGLE-TR-3 was later proved to be wrong (cf. Astrophysical Journal Volume 497, page 1076) - it was based on much less accurate radial velocities than for the present results. Are you a journalist? Subscribe to the ESO Media Newsletter in your language.